Marc-Olivier Lamontagne is a Canadian guitarist who specializes in contemporary music performance on classical and electric guitars. He is a sought-after soloist, improviser and chamber musician who regularly performs with new music ensemble such as the Nouvel Ensemble Moderne, Orchestre 21, Chants libres, Ensemble Punctum (of which he is the Artistic Director) and Ensemble La Machine (of which he is a founding member). During the upcoming season, he will also perform with ECM+, Quasar and Quatuor Bozzini. 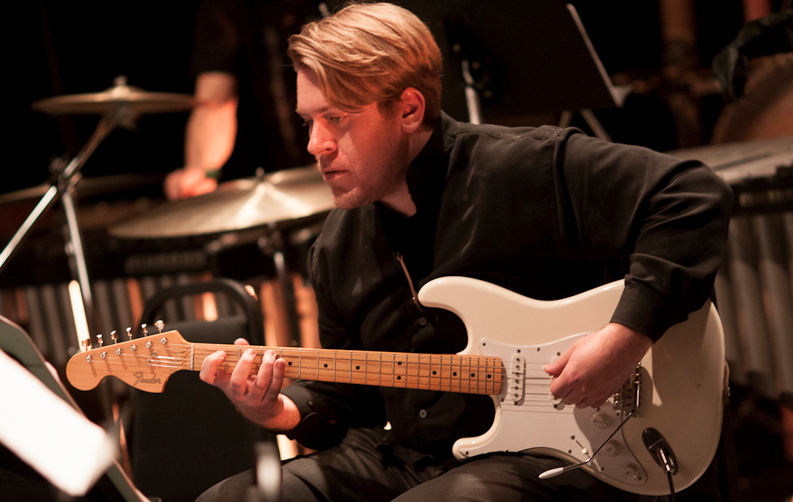 Marc-Olivier has premiered several solo and ensemble works for guitar both in Canada and Europe. He has served as Artistic Director of Ottawa New Music Creators since 2012, and became President of the Montreal new music concert production association, Codes d’accès, in November, 2013. Marc-Olivier Lamontagne just completed a doctorate in New Music Performance with Lorraine Vaillancourt and Bruno Perron at the University of Montreal. Thanks to grants from the Canada Council for the Arts, he spent time as a resident at the Cité des Arts in Paris, where he studied with Judicaël Perroy and Alberto Ponce.